OK I know this may look like some type of torture device, but it's actually my favorite tool for 2011. I give you, the belt hole punch. You see, I've strayed a bit from my ideal (aka high school) weight so some of the fabulous belts that I got back in the day just don't fit the way they used to. And, as I'm sure you know, belting is in right now. So I have run in to a few situations where I bought a pants belt to fit around my hips but every once in awhile I may need it to function as a dress/tunic belt hitting at my natural waist, and vice versa. What's a girl to do? Yep, you got it: belt hole punch to the rescue! I was at the local hardware store one day checking out all the random utensils and storage containers and I found this little gem in the craft/sewing section. From the moment I saw it, I knew my life was about to change for the better. I swiped it up for a cool $20 bucks and didn't have to think twice. I rushed home and started punching holes in leather like my life depended on it. 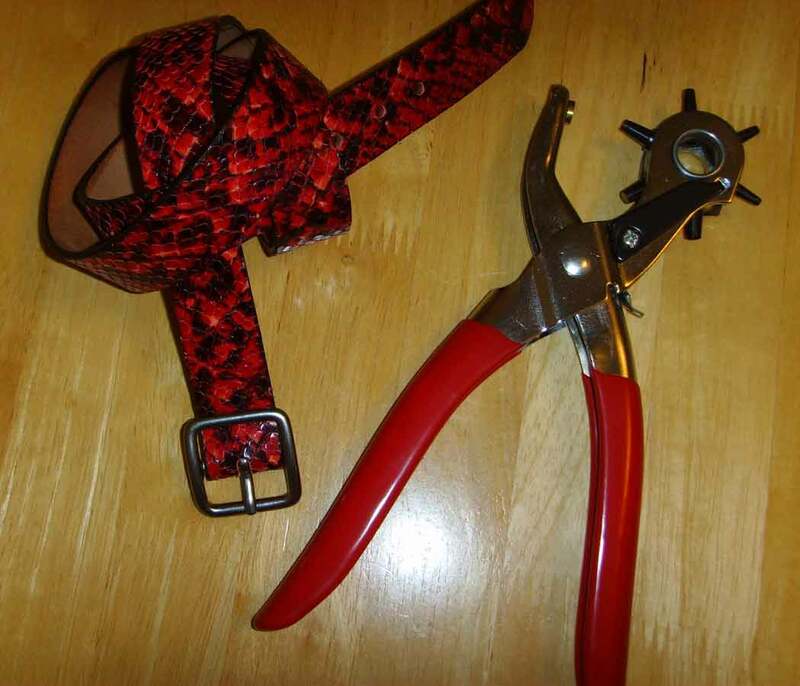 I grabbed up my favorite tan belt, the thick brown belt and the skinny brown belt, the red and black faux snake skin (pictured above) and got to work. And the hole punch has 6 different sizes to choose from so all my new notches fit right in with the originals. Now every belt I own can fit a size small, medium, or large and that means that I can match each belt to my current outfit, mood, and (let's be honest) body mass.